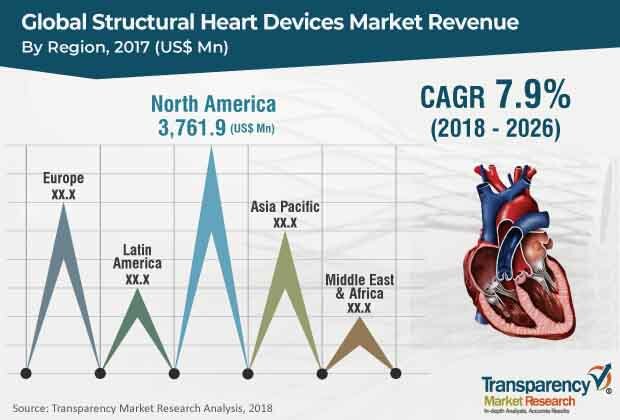 Transparency Market Research (TMR) has published a new report titled, “Structural Heart Devices Market - Global Industry Analysis, Size, Share, Growth, Trends, and Forecast, 2018–2028.” According to the new report, the global structural heart devices market was valued at US$ 9,444.0 Mn in 2017 and is projected to expand at a CAGR of 7.9% from 2018 to 2026. Surge in awareness about valve regurgitation and valve stenosis is anticipated to propel the global market between 2018 and 2026. North America and Europe are expected to dominate the global market, owing to an increase in demand for novel technologies. The market in Asia Pacific is projected to expand at a high CAGR during the forecast period. The structural heart devices market in Latin America is likely to grow at a moderate pace during the forecast period. Key factors contributing to the growth of the market in Brazil are rapid improvement in health care infrastructure and increase in purchasing power of people. Additionally, health care companies strive to cut hospitalization costs, while offering better services to patients in the country. Rise in awareness about minimally invasive heart surgery in South Africa propels the market in the region. According to the American College of Cardiology (2018), heart disease is the most frequent condition in older adults and the no. 1 cause of death. Cardiovascular diseases account for 17.9 million deaths each year. According to the American Heart Association, people aged 75 and older account for 66% of cardiovascular disease deaths.